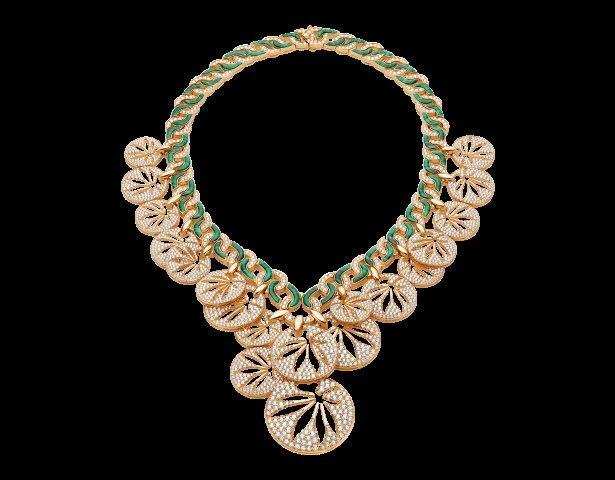 Last January, Lucia Silvestri, who is the creative director of Bulgari, the top jewelry brand, wore a $320,000 bib-style necklace of gold cannabis leaves encrusted with diamonds and rubies, when she attended the 2019 Town & Country Jewelry Awards in New York. Something like this was unthinkable some years ago. A few years ago it was possible to find cheap costume jewelry with marijuana motifs in street markets. While attending another event in Los Angeles one week later, she wore a necklace made of yellow gold that was adorned with diamonds medallions bearing cutouts of marijuana leaves. Apparently, the image of Lucia Silvestri wearing the marijuana leave necklace, that is part of Bulgari’s 2018 Wild Pop range, named collection of the year by Town & Country, seems like a naïve reference to Mother Nature. But for whoever who knows cannabis, the message was clear. It is a reference to cannabis; not an ode to Mother Nature. Lucia Silvestri was asked about it and she declared that Bulgari likes taking risks and the brand has decided to do something different for contemporary standards. She said that marijuana leaves were absolutely beautiful and the plant itself is legal. Bulgari thinks it shouldn’t be a scandal. In fact, it always happen the same. The upper class and the bourgeoisie love wearing things that were illegal in the past. When it was illegal, they didn’t want to take risks. Bur now, wearing such a marijuana necklace, gives them a hippie touch that is very fashionable. It is true that being Bulgari a famous European jewelry house clearly steeped in tradition, this type of “modern jewelry” is a risky business. Or at least it is in the theory; because it is quite opportunistic too. We cannot forget that weed is legal in modern and developed countries such as Canada and some states in the USA. Therefore, it was just a question of time before the jewelry industry took the chance to enter this extraordinary market. Cannabis is becoming a billion-dollar industry, stated Stellene Volandes, editor in chief of Town and Country. 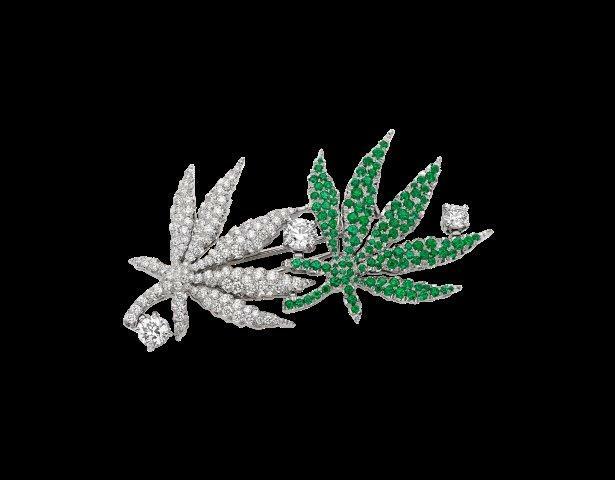 Marijuana designed jewels have become a guide for the highest elite in its February issue. This tendency was born in Southern California: the pot industry paradise. Long before California legalized recreational cannabis in 2018, and Jacquie Aiche, the Beverly Hills-based jeweler, threaded the cannabis leaf symbol throughout her Sweet Leaf collection of bohemian accessories. This new line includes denim shirts and snake tubes to wear joints. Jacquie Volandes says it all began in 2010, with the small Sweet Leak stud. Cannabis was very provocative at that time. She decided to create something different for “bad girls” who wanted to feel free, happy and enjoy the “high life”. 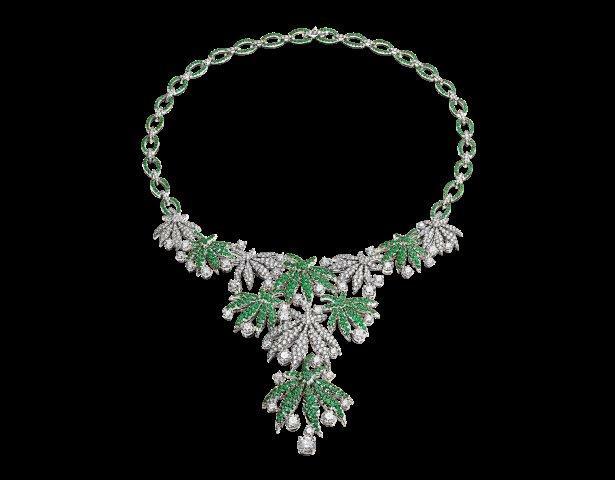 There is a list of the 10 most luxurious companies in the jewelry sector. And Bulgari is always the number one. Cannabis is fashionable. When the top brands that set the tendencies begin to use cannabis leaves in their designs, you can tell this industry has seen in cannabis a source of inspiration. Its high jewelry Wild Pop necklace and broach includes different marijuana motifs and the firm describes it as audacious, irreverent and undoubtedly Bvlgari. How far are those days when marijuana was related to young people who wore long hair and old clothes! If you attend the new cannabis events, you will find elegant executives wearing $ 2000 suits and silk ties. And very few are younger than fifty years old.